If you're unable to play or edit a certain audio file the way you want because the format isn't supported by the software you're using, one of these free audio converter software programs or online tools can help. Audio file converter tools are also helpful if your favorite music app on your phone or tablet doesn't support the format that a new song you downloaded is in. An audio converter can convert that obscure format into a format that your app supports. Every audio converter program below is freeware. We haven't listed any shareware or trialware audio converters. One process not covered below is YouTube to MP3. Since "YouTube" isn't an audio format, it doesn't strictly belong in this list, but it's a common conversion nonetheless. 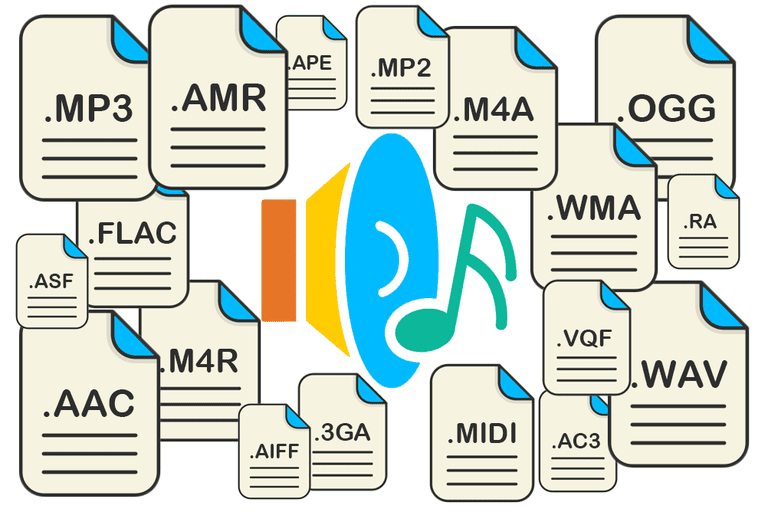 Freemake Audio Converter supports several common audio formats and is extremely easy to use. However, it only supports audio files that are shorter than three minutes. In addition to converting single audio files into other formats in bulk, you can join multiple files into one larger audio files with Freemake Audio Converter. You can also adjust the output quality before converting files. The biggest drawback to this program is that have to buy the Infinite Pack to convert audio files that are longer than three minutes. The installer for Freemake Audio Converter will attempt to install another program that's unrelated to the converter, so be sure to uncheck that option before finishing setup if you don't want it added to your computer. You might also want to check out Freemake Video Converter, another program from the same developers as Freemake Audio Converter that supports audio formats too. It even lets you convert local and online videos into other formats. However, while Freemake Audio Converter does support MP3s, their video software does not (unless you pay for it). Freemake Audio Converter can for sure run on Windows 10, 8, and 7, and is likely to work with older versions too. FileZigZag is an online audio converter service that will convert most common audio formats, so long as they don't exceed 180 MB. All you do is upload the original audio file, choose the desired output format, and then wait for an email with a link to the converted file. You can upload remote audio files via their direct URL as well as files stored in your Google Drive account. The worst thing about FileZigZag is the time it takes to upload the audio file and receive the link in your email. However, most audio files, even long music tracks, come in a pretty small size, so it's not usually a problem. FileZigZag should work with all operating systems that support a web browser, like macOS, Windows, and Linux. Upload the file from your computer or enter a URL to an online file that you need to be converted. Also, Zamzar's conversion time is slow when compared to other online audio converter services. If you're looking for a simple program that works without the advanced options and confusing interfaces that some of these audio converter tools have, you'll definitely like MediaHuman Audio Converter. Just drag and drop the audio files you need to be converted directly into the program, choose an output format, and then start the conversion. If want more advanced options, MediaHuman Audio Converter does let you customize things like the default output folder, whether you want to automatically add the converted songs to iTunes, and if you want to search online for cover art, among other options. The following operating systems are supported: Windows 10, Windows 8, Windows 7, Windows Vista, Windows XP, Windows Server 2003, and macOS 10.5 and newer. Hamster is a free audio converter that installs quickly, has a minimal interface, and isn't hard to use. Not only can Hamster convert multiple audio files in bulk, but it can merge the files into one, much like Freemake Audio Converter. After importing files to convert, Hamster lets you choose any of the output formats from above or pick from a device if you're not sure what format the file needs to be in. For example, instead of choosing OGG or WAV, you can pick the actual device, like Sony, Apple, Nokia, Philips, Microsoft, BlackBerry, HTC, and others. Hamster Free Audio Converter is said to work with Windows 7, Vista, XP, and 2000. Supports editing information like the song's album, artist, etc. VSDC Free Audio Converter has a tabbed interface that's uncomplicated to understand and isn't cluttered with unnecessary buttons. Just load up the audio files you want to convert (either by file or folder), or enter the URL for an online file, choose the Formats tab to select an output format, and click Start conversion to convert the files. There's also a tag editor for modifying a track's title, author, album, genre, etc., as well as a built-in player for listening to songs before you convert them. The installer will try to add unnecessary programs and tools to your computer if you let it. Be sure to watch for these and disable them if you wish. Overall, VSDC Free Audio Converter is just as quick as most of the other tools in this list and is great for converting your files to a common format. VSDC Free Audio Converter is said to be compatible with all Windows operating systems. Media.io is another online audio converter, which means although you don't have to download any software to use it, you do have to upload and download your files to make it work. After loading one or more audio files to Media.io, you just need to choose one of the output formats from below. When the file is ready to be downloaded, use the small download button to save it to your computer. Once the files have been converted, you can download them individually or together in a ZIP file. There's also an option to save them to your Dropbox account. Unlike the above programs that may work with specific operating systems only, you can use Media.io on any OS that supports modern browsers, such as on a Windows, Linux, or Mac computer. Another free audio converter is called Switch (previously Switch Sound File Converter). It supports batch conversions and whole folder imports, as well as drag and drop and lots of advanced settings. You can also use Switch to extract audio from your video files and CDs/DVDs, as well as capture audio from a live audio stream from the internet. Make sure to use the download link in the "Get it Free" section. Some of the advanced settings in Switch include deleting the source audio file after a conversion, automatically normalizing audio, editing tags, and downloading CD album details from the internet. Another option worth noting is one that lets you set up to three preset conversion formats so that you can right-click on an audio file and choose one of those formats for a quick conversion. It's a huge time saver. macOS (10.5 and above) and Windows (XP and newer) users can install Switch. Some users have reported that the program stops letting you convert files after 14 days. If that happens to you, something you might try is starting the uninstall process and seeing if Switch asks you to revert to the free, non-trial version (instead of removing the program). Some users have also reported that their antivirus software identifies Switch as a malicious program. If you're having troubles with Switch, try using a different program from this list. The only reason it remains here is that it works perfectly fine for some people.